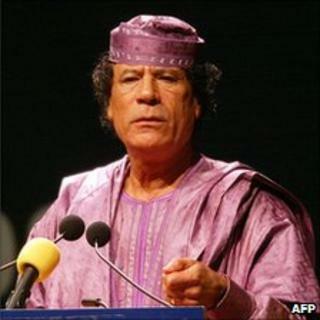 Image caption Col Gaddafi has advocated a "United States of Africa"
Richard Dowden, director of the Royal African Society, tells the BBC World Service that Africa would be a quieter place without Libyan leader Colonel Muammar Gaddafi. Gaddafi's main contribution to Africa since 1999, when he turned away from the Arab League and the Middle East to try to form a United States of Africa, has been to bribe and buy his way to the chairmanship of the African Union, to promote this idea of a borderless Africa, presumably led by him. He did this in two ways. Firstly, he sought simply to buy the smaller, poorer states by bribing their presidents. Secondly, in states where he was opposed, he would fund opposition movements. So he has been extremely divisive in his relations with Africa, and his removal will quiet things down a bit. The presidents of Nigeria and South Africa had to fight a running battle with him to stop his crazy ideas of subverting Africa, trying to make it into one, single country, just like that. It is hard to say if he has ever genuinely been seen as a fellow African leader by other African leaders. He supported the ANC in South Africa, and Swapo in Namibia, and when Nelson Mandela came out of prison, he went to Libya almost straightaway to thank him. But while he continues to support groups like that, he has also sided with appalling movements in western Africa which he saw as revolutionary. He has backed Charles Taylor, now on trial in The Hague, and Foday Sankoh, the dreadful rebel leader in Sierra Leone who led the Revolutionary United Front, which cut off hands and legs. So he has a very mixed record in his very idiosyncratic way. Libya was the main route for ambitious young Africans trying to get to Europe and make a life for themselves. Libya's own, booming economy also absorbed a lot of Africans. Yet Gaddafi actually encouraged xenophobia against them. Rather than protecting them, he would expel them en masse from time to time. So there is this tension between sub-Saharan, black Africans and the Libyans, which the government has never properly dealt with. I think that some of them now have probably nothing to lose. If they are given guns and told to use them, they may well do so. Many of them may be mercenaries in the pay of Gaddafi.